The Large and Small Magellanic clouds were thought to be the closest galaxies to ours, until 1994, when the Sagittarius Dwarf Elliptical Galaxy (SagDEG) was discovered. In 2003, the Canis Major Dwarf Galaxy was discovered - this is now the closest known galaxy to ours! The Large Magellanic Cloud (LMC) and its apparent neighbor and relative, the Small Magellanic Cloud (SMC), are conspicuous objects in the southern hemisphere sky, though they are no longer the closest galaxies to ours. They were certainly known of since the earliest times by the ancient southern astronomers, but these people produced little documentation. It was Magellan, on his trip around the world in 1519, who brought them to our knowledge. Image Credit: Anglo-Australian Observatory/Royal Observatory Edinburgh. They were made from UK Schmidt plates by David Malin. The Magellanic Clouds are irregular dwarf galaxies orbiting our Milky Way galaxy. The LMC is full of interesting objects including diffuse nebulae, globular and open clusters, planetary nebulae, and more. 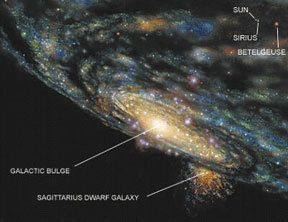 The SMC, also an irregular galaxy, may be a distorted barred disk, deformed by the tidal forces of Milky Way and LMC. The LMC is 179,000 light years away from the Milky Way. The SMC is further out, at 210,000 light years. The SagDEG wasn't discovered until 1994, both because it is very dim, and because it was obscured by the central part of our galaxy. Though this galaxy is quite big (about 10,000 light years across), it will likely be disrupted by the tidal forces from the Milky Way Galaxy. (For comparison, our galaxy is 100,000 light years across.) 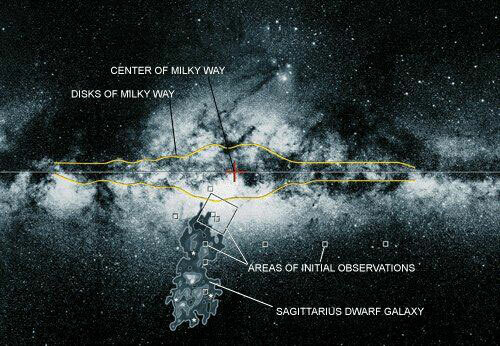 The SagDEG is on the other side of the Milky Way from the Sun, about 70,000 light years away. It is 50,000 light years away from the center of the Milky Way - it is so close to us, that some of the SagDEG's stars are actually in the outermost regions of the Milky Way! The Canis Major Dwarf Galaxy is only 25,000 light years from the Sun, and 42,000 light years from the Galactic center. 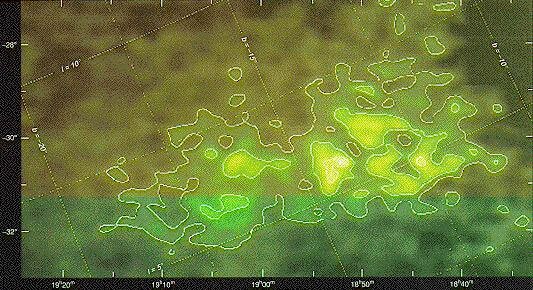 It too, is well-hidden by the dust in the plane of the Milky Way - which is why it wasn't discovered until recently. This galaxy is also being pulled apart by the Milky Way's gravity - as it orbits the Milky Way, it is leaving a long filament of stars, gas, and dust in its wake. This 200,000 light year-long filament is known as the Monoceros Ring, and actually wraps three times around our galaxy! The Canis Major Dwarf galaxy was discovered in the course of the investigation of this Ring, which was first discovered in 2002. 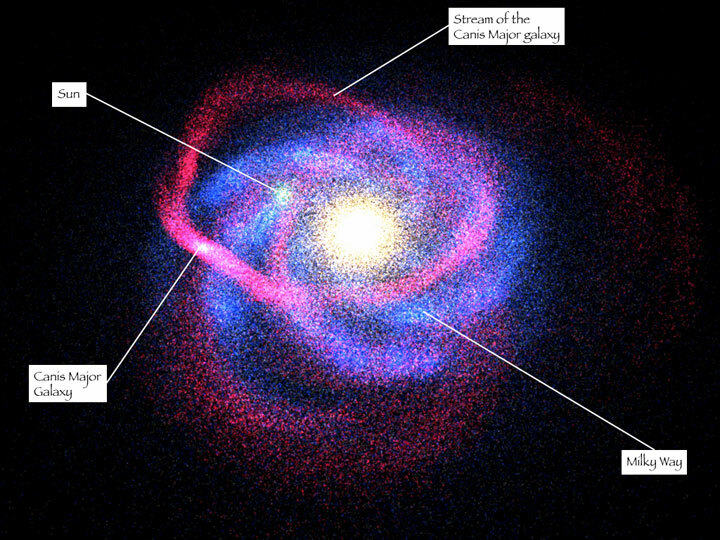 At left is an illustration of the Milky Way, the Canis Major Dwarf, and the stream of material coming from the Galaxy. The closest known galaxy to us is the Canis Major Dwarf Galaxy, at 236,000,000,000,000,000 km (25,000 light years) from the Sun. The Sagittarius Dwarf Elliptical Galaxy is the next closest , at 662,000,000,000,000,000 km (70,000 light years) from the Sun. The Large Magellanic Cloud, 1,690,000,000,000,000,000 km (179,000 light years) away, was once considered the nearest galaxy outside of the Milky Way. The Small Magellanic Cloud is 1,980,000,000,000,000,000 km (210,000 light years) away. Astronomers primarily use Cepheid and/or RR Lyrae Variables to measure distances to the LMC, the SMC, and the Dwarf Galaxies. The distance to the LMC has come to play such a crucial role in establishing the extragalactic distance scale that several research groups are applying a variety of methods other than the Cepheids and RR Lyraes. These alternative techniques, which include the use of SN 1987A, the so-called red clump stars, and eclipsing binaries are used to check the accuracy of the period-luminosity relationships. By using several different methods to determine distances, astronomers can increase the accuracy of and our confidence in the RR Lyrae and Cepheid methods, and the distances determined by them. For more information about Cepheids and RR Lyrae, please read the section on calculating distances in the Milky Way. If you measure the distance to one object in the LMC, for example, you know the distances to all the millions of objects in the LMC fairly accurately. Of course, there are not all exactly the same, but the thickness of LMC, as seen from the Earth, is much smaller than the typical uncertainties in the distances to individual objects in the Milky Way. Astronomers therefore often study LMC objects then calculate their true brightness from their apparent brightness and the latest (the most accurate) distance to the LMC. For example, astronomers have studied the supernova remnants to compare with theoretical models, or to derive a relationship between their size, energy, and brightness. To get to the closest galaxy to ours, the Canis Major Dwarf, at Voyager's speed, it would take approximately 749,000,000 years to travel the distance of 25,000 light years! If we could travel at the speed of light, it would still take 25,000 years!